We utilize Global Positioning System (GPS) technology for construction layout and for automated grade controls on company bulldozers and motor graders. Computer Aided Drafting (CAD) software is used to create a grading or earthmoving job of virtually any size. The project is then uploaded to on-board computers, allowing the equipment operators to perform at higher productivity levels by simply following the direction of the computer screen in the cab. Field layout is nearly eliminated because survey data and control points are entered into the computer by our skilled engineers and technical staff, prior to project startup. This technology allows for more accurate and reliable grade control, nearly instantaneous quantity tracking and higher productivity levels. We perform the majority of our work as a general contractor due to our proven track record of being able to meet project commitments. Our self-performance capability in various disciplines enhances our ability to manage and direct project costs, schedule and overall construction quality. 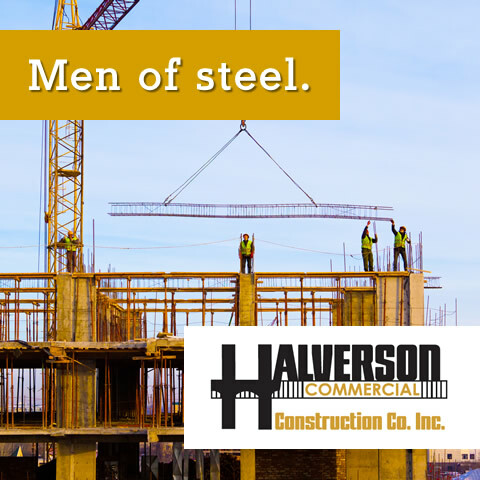 You can expect Halverson Construction to provide your company with responsive leadership and management throughout the project duration, from groundbreaking to closeout. Based on our relationships with architects, engineers, consultants, material suppliers and subcontractors, Halverson is able to form successful Design-Build teams to meet the needs of our clients. The value that Halverson adds to a Design-Build project is vast experience on a variety of projects, our capability to review designs for constructability, and our cost estimating experience. By adding our Halverson’s team of professionals to your planning and design process, we are confident our experience and efficiencies will save you time and money. A reputation for excellence is a driving factor for other general contractors and construction managers to solicit subcontractor quotes for Halverson’s services. We actively seek new opportunities as a subcontractor for steel erection, reinforcing steel installation, precast concrete erection, tilt-up concrete, reinforced concrete work, finish and rough carpentry, drywall and framing, earthwork, sheet piling, and driven pile foundations. At Halverson Construction Co., Inc., we relish technical engineering challenges. Successful planning, design, and implementation combined with technical knowledge and experience from our in-house staff of licensed Professional Engineers offers a value other local firms find hard to match. Halverson Construction owns a variety of specialty equipment including a Diamant-Boart PDM-3000 Grooving Machine, which allows for bridge deck, airport and highway pavement grooving, as a specialized service for our own clients as well as for other contractors. Bridge Parapets and Barrier – conforming to Illinois Department of Transportation standards is the core of our application for our slipforming services. Sidewalks – up to 6-feet wide; applications include streetscapes, subdivisions, bike paths, commercial building walks, golf cart paths, agricultural and irrigation ditches. Curb & Gutter – various mold sizes to fit the cross section of barrier type, mountable type as well as v-pan curb and gutter.